While we all love our stompbox collections, no one loves dealing with pedals that won’t stay in place. Some of us might enjoy playing pedalboard Tetris to make all seven pedals accessible on a 14 inch-wide rectangle, but for the rest, it’s a pain. Most of us have at least one pesky pedal that always pops out of place every time you carry your board, or one that requires sniper-like aim to toggle with your boot while playing a show. 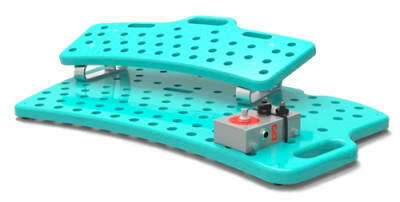 For starters, the Holeyboards have two levels – a Top Shelf and the Main board – so it’s easy to access the pedals in the back row without pointing your toes. I was the first to do this in 2007. The HoleyRisers that hold up the Top Shelf are customer designed and made by me out of 6061 aircraft grade aluminum. They are bulletproof. For Starters there is no velcro anywhere. using zip ties, which in my opinion are one of the greatest inventions of the 20th century. They are quick, hold tight and are easy to change. They don’t damage your pedals like velcro and adhesives do and they never fall off or move. Third, the deck is curved to follow the arc of your leg motion for easier, quicker access. These little details make it great. There are also two carry handles are integrated into the board, and I have a lifetime warranty on all of my Holeyboards. They are built like tanks but are lightweight due to all the holes. They weigh as much or less than the other boards out there. Johnny Marr Playing Rory Gallagher’s Strat! Johnny Marr dropped by the day after receiving his God Like Genius Award from the NME to play on a few guitars and amps from Rory’s collection. It was fantastic to hear Johnny Marr play some classic Rory Gallagher riffs on Rory’s legendary 1961 Fender Stratocaster and Fender Bassman ahead of what would have been Rory’s birthday on March 2nd..
A unique piece!!! A previous owner decided to turn a vintage ’66 Harmony made Silvertone into an Eddie Van Halen inspired guitar. My guess is that the paint was done at least 20 years ago. A newer humbucker was added in the bridge position. The routing is very clean and the work was done well. The original neck sounds great and works fine. The frets are very good and show no signs of wear. The neck is straight and the guitar plays great. The tone pot on the bridge position is snapped off but it still works. Missing that knob too. All guitar legends have moments on record when they played something so fresh, compelling and memorable that it forced everyone to stop and listen. That’s what makes them legends and not merely great guitarists. Van Halen and “Eruption.” Page and the solo from “Stairway To Heaven.” Hendrix and…well, take your pick. If not moments of arrival, these are at least high water marks by which the artist will always be remembered. Clapton’s solo from “Sunshine Of Your Love” is one of those moments. Aside from the soulful and lyrical phrasing, his dimed yet buttery guitar sound – something he called the “woman tone” – etched itself into listeners’ minds forever. There are ways to approximate the “woman tone” without Clapton’s exact rig, but first let’s take a look at how old Slow Hand got the tone himself. 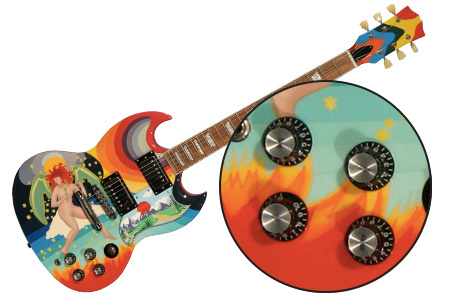 Most would agree that the tone was born with the recording of Disraeli Gears, Cream’s second LP. With only a handful of days before the band’s visas expired, the album was hastily recorded from May 11 – 14, 1967. 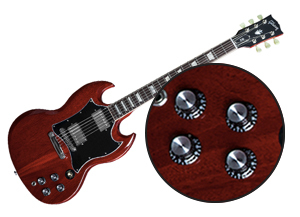 Clapton alternately played a psychedelic-looking Gibson SG (known as “The Fool”) and Black Beauty Les Paul Custom through a 50-watt Marshall half stack for most of the session. We’d be remiss if we didn’t mention how Clapton’s tone made it onto record. Part of the rig used to create the tone, in a way, included the recording equipment used at the 8 track Atlantic Studio in May ’67. 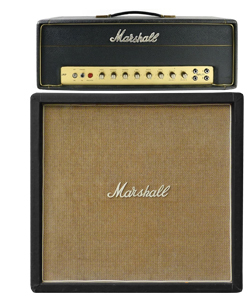 The blaring Marshall half stack was recorded with a single B&K ribbon mic at a 45-degree angle (to protect the aluminum ribbon) with a Western Electric 639A cardioid mic on a stand a few feet beyond that. If you think about that for a second, you’ll realize that part of the tone we actually hear on record is a function of the mics overloading. Just a disclaimer for those who are deadset on sounding exactly like the recording in their basement. If you’re looking to get the “woman tone” without getting a totally new rig, here’s a guideline. It will sound most authentic with humbuckers, so let’s start there. Flip the pickup selector to the middle position. Roll the tone all the way down. Roll your bridge volume to six and your neck volume to ten (dimed). 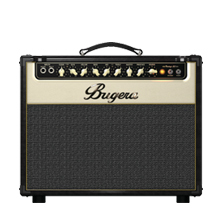 Push whatever amp you have near the threshold (tubes required), rolling back tone and highs/mids on the amp as necessary if you have a particularly bright amp. 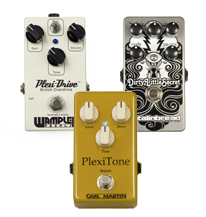 You could also try a “Marshall-stack-in-a-box” pedal, like the Catalinbread Dirty Little Secret, the Carl Martin PlexiTone or the Wampler Plexi-Drive, to get the effect at lower volumes. If you only have a guitar with single coil pickups, it will be a bit harder to make it sound authentic. Flip the pickup selector to the full neck position and dime its volume knob. Roll off the tone all the way. You’ll have to do some EQ beefing on your amp. Turn the bass up to 8 or 9. Turn down mids/highs to about 5. Punch up that amp volume. If you’re still sounding too thin, the pedal route might be your best bet. What do YOU think? STILL GROOVY or TURN OFF THE LIGHTS?